There’s no can’t, in kanten! This jello-like dessert is light and refreshing. And would you believe… also great for your hair and nails! 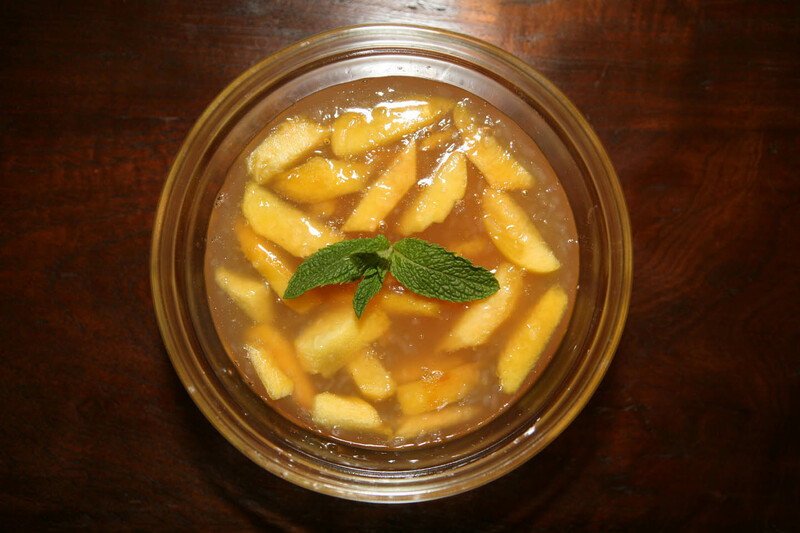 Fruit aspics are referred to as “kanten’ in Japanese and Macrobiotic cookbooks. This kanten calls for the items Agar Agar and Kuzu, both of which are detailed on our Ingredients page. These ingredients might be new to you, but they have been around for centuries. We use the products by Eden that can be purchased at Whole Foods and Mom’s Organic Market. Another great resource is Gold Mine Natural Food Company. 1. Place the mint in the apple juice and bring to a boil for a couple of minutes. 2. Remove the mint by pouring the liquid through a fine strainer into a bowl. 3. Return the mint-infused apple juice to the stove and add Agar Agar and salt. 4. Bring mixture to boil. 5. Simmer and stir until Agar Agar is melted. 6. In a small bowl, dilute Kuzu in cold water. 7. Add Kuzu into the Agar Agar mixture and stir until thick and translucent. 9. Pour liquid mixture over the peaches and let cool. 10. Place in refrigerator until firm to the touch. Makes enough for four servings. Looks fabulous! And easy to make. By the way, the Wake Me Up Before I Go-Go Oatmeal has become a staple in our house. Love it! Thanks so much for the comment. Very easy to make. So happy that you like the “Go-Go!” More to come! Very easy and the mint was a nice variation.